British Airways A380. Photo by Airwolfhound. Airfare Score of the Year! Back in October British Airways had an amazing business class sale between the United States and Europe. By combining the sale price, a $400 discount for becoming an AARP member (No minimum age to join) and a 30,000 Avios buydown, tickets were crazy cheap. In fact, early in the day of the sale I bragged about a ticket I purchased for a trip in January from Las Vegas to London that cost $408 plus 30K Avios! That particular fare should earn around 50K AAdvantage miles because of a bonus promotion that ends on January 31 along with the normal miles earned, class of service bonus and of course my Executive Platinum bonus. It will be quite a score, but it wasn’t my “score of the day”. Our first trip to Barcelona was in 2009. We flew there on a Delta mistake fare for $209 each roundtrip. Better yet, we each received $600 compensation for voluntarily getting bumped one day so we came back over $1,200 ahead! Later in the day I began thinking of cool trips to take on this fare so I began searching for flights during my son’s Spring Break week. Eventually I was able to secure four business class tickets (including a separate ticket for the baby) for $244 in cash TOTAL plus 120K Avios. The route we are taking is LAX-LHR-BCN-LHR-LAS. We are leaving from Los Angeles so we can fly on the A380. On the surface this deal looks great, but it is even better than you think. Remember this is a revenue ticket and not an award ticket. That means my wife, son and daughter will all earn about 15,000 AAdvantage miles on this route. As an Executive Platinum member, I should earn double that although I am hoping for some sort of bonus program to increase it even more. Either way, we should earn at least ~70K AAdvantage miles. Four roundtrip business class tickets to Barcelona for 120K Avios plus $244. To put this deal in perspective, one roundtrip business class ticket from the U.S. to Europe costs 100K AAdvantage miles roundtrip. (Before the devaluation.) If you are lucky enough to fly on an airline with no fuel surcharges, the cost in taxes is $53.20 on that route. Flying BA costs $1,030 in fuel surcharges plus the miles! In other words, the $61 per person barely covers the taxes on the award ticket plus we don’t have fuel surcharges. This is basically how I look at it. We each paid $61 plus 30,000 Avios to travel to Europe during Spring Break week (the travel is the most important thing in my book) and earn about 15K or more AAdvantage miles. Pretty darn good in my book. How Did This Price Happen? On our last visit we were a family of 3 and Shawn Reece was much smaller! It will be great to bring the baby to one of our favorite countries! At this point you are probably wondering how I got this price considering it cost me over $400 for one ticket to London. The answer lies in the Avios buydown. With that promotion 30K Avios were spent to offset the cash fare about $750 per person. Well, apparently the system mis-priced one of the four tickets, but still allowed the Avios buydown. This made the cash portion quite low. 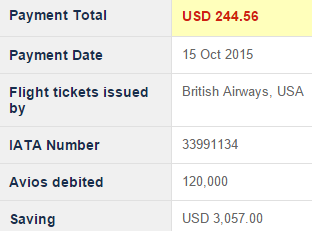 Unfortunately British Airways tried to charge us over $1,100 for the tickets despite their website and my receipt showing the $244 amount. It took about six weeks for them to correct the issue, but eventually they honored the price as quoted. I’m not sure they had much of a choice, but I’m glad it was resolved without any issue. Since I hate calling on the phone, I was able to deal exclusively with the British Airways Twitter team to get this problem solved, but it took a long time. A friend had a similar issue with his ticket and spent a few hours on the phone before getting it resolved. Different approaches but both worked. Personally I would rather wait a bit then deal with getting transferred and hold times, but you can’t argue with getting it solved in one or two days as opposed to six weeks. I have scored some amazing tickets including that 2009 mistake rate to Barcelona, but I think this ranks among the best deals I have seen considering it fits within the exact week we needed and includes business class travel for the entire family. I shared this story not to brag, but to provide some deconstruction and to remind everyone that deals like this do come around, but don’t last. I am so excited for our first European adventure as a family of four! March can’t come soon enough! Did you get a deal during that sale? What plans were you able to make? Feel free to share your experiences in the comments! Next articleTravel Deal of a Lifetime, New Amex Offers, Retail Arbitrage, Amex Chat Must-Do & More! Congratulations – reading the above, “somebody’s” bio needs updating for a +1. Congratulations, Shawn! I caught an episode of House Hunters: International today that featured Barcelona, and instantly put it on my Must Visit List. WOW nice score. Congrats! New to the game love reading your posts. My wife and I got 2 business class British Airways tickets LAX via LHR to Rome round trip for $850 each in the same sale. The big difference from your London price was I didn’t see the sale till late afternoon. I got the $400 AARP discount and used the 30000 avios to buy down the price another $750 each to get to the $850 each price. We still think it’s a good bargain but your London price is amazing and your 4 tickets for $244 is the deal of a lifetime. We have never been to Europe and have never bought business class before. We are frightened by the Paris and San Bernardino terrorist attacks enough to consider cancelling but that would cost almost $600 each in penalties. We haven’t booked any rooms yet and are waiting to see what happens in the next few months. I got in on the sale, but have no Avios. I’m still very happy with the mileage score, because I’m planning on using the AA miles to go to South America. Two trips for the price of 1!